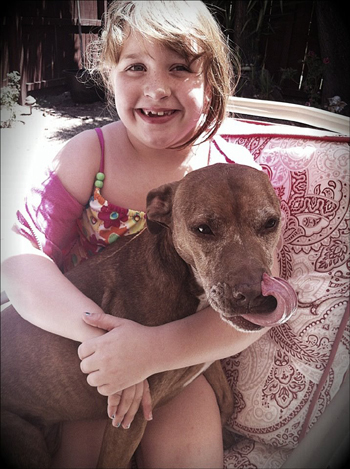 This is my 6-year-old niece and her elderbull, Roxy. Roxy has been through it all with Shelby; dressed up like a princess, ridden around like horse, pinched, pulled and pushed around. Yet, she loves Shelby just the same. As you can see, Roxy is getting grey around her face, but she is still a young pup, full of energy when she and Shelby play. Just wanted to share this little girl and her best friend with you and those that love their elderbulls. Roxy and Shelby look like a happy pair. Great picture of “Roxy and Her Girl” . Great picture of “Roxy and Her Girl”. Roxy and Shelby look happy together.